New Zealand is a playground that ensures no two days are the same. Kiwi Experience offers you the opportunity to experience the dopest activities and adventures your heart desires. Allowing for all budgets and appetites; we ensure each passenger gets what they want out of their trip. Check out the below for the list of activities available or speak to your driver today. Our Driver Guides handle all the activity bookings for you. Once you are on the bus choose from a wide range of activities available that day. We offer a great mix of free and paid activities – all optional to ensure your Kiwi Experience is truly yours! We only work with the best New Zealand activity providers who hold spaces for us each day so you don't need to worry about missing out. 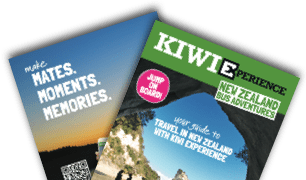 Travelling with Kiwi Experience will save you loads of cash with exclusive deals on the best activities that New Zealand had to offer and a "Best Price Guarantee". This means if you see any of our suggested activities advertised cheaper elsewhere (that matches the same timeslot), show your Driver Guide and our activity providers will match that price. The best things in life are free – or near enough to it – and that could not be truer than in New Zealand when travelling with Kiwi Experience. Each bus journey includes lots of epic walks and photo stops as well as advise of what to do when you get to the overnight stops. If you prefer to pre-purchase some of our best sellers, we have some pretty sweet Activity Packs you can buy before you jump on the bus. We provide you with the vouchers and it's up to you when you want to use them (while you are on the bus). Your driver guide will still help to book the activities in as you travel, but the cost will already be taken care of.